Obama being born out of an apple pie in the middle of a Kansas wheat field as Toby Keith sings the National Anthemsuch are the contents of an amicus brief filed by an Alabama Democrat Party which has resorted to ridicule in responding to the Obama eligibility case McInnish-Goode v Chapman which will be held in front of Judge Roy Moore and the Alabama Supreme Court! In an exclusive story, WND reporter Drew Zahn, (1) claims the flippant nature of this brief indicates that the Obama team will be unable to brush off legitimate questions about how he can serve as a U.S. President without showing legitimate and verifiable evidence of eligibility! ***This is the strangest thing. . .the president has never produced evidence in the face of substantial evidence he was not born in our country, said Judge Moore. *** Strangest thing? The understatement of the year. The only reason Obama has gotten away with this is because members of the judiciary have been giving out favors like some used-up dock-whore in Shanghai. THIS, the forged BC and his ineligibility to serve as president, should the the primary focus, almost the SOLE focus, of conservatives. Sheriff Joe has it right. Prove this, and everything else is instantly solved. I believe these Obama’s scandal may help aid in revealing the truth about Obama. duplicate post—but some BC related screenshots within relative to this thread too. This is the strangest thing. . .the president has never produced evidence in the face of substantial evidence he was not born in our country, said Judge Moore. Not so strange coming from a universal liar. Lies about operation Fast and Furious. Lies about AP phone records. And countless other lies said by Obama. And we're suppose to believe Obama is telling the truth about his proven bogus birf certificates? LoL. The guy is an infiltrator. Too late. Romney was our only chance. Did somebody forget to tell Romney? Alex Okrent can explain all the details of the fake bc.. Oh wait, he died suddenly of a heart attack at the age of 29. Many did not vote after calling Romney names. 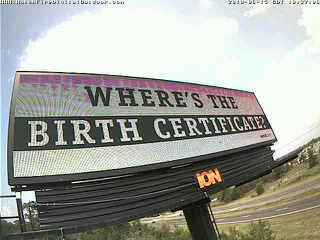 At this point, states could call his birth into question, but what gets done about it? Too late to recast their electoral votes. And individual states won't mean anything nationally. And a national push would probably take longer than he's got left. But let's say that it doesn't, and we can prove beyond a doubt to all but the staunchest supporters that he's not borm here. Then what? The Constitution doesn't have any means of removing someone sworn into the office other than impeachment. So impeachment procedings have to begin. Articles drawn up and voted on. Sent over to the Senate for a trial. And on and on and on . . .
Dan Rather is working on a birth certificate as we speak. If it is proven that he is a foreigner he would be out by sundown. Impeachment is a mechanical method. Any the fraud was ever accepted and acknowledged the support would evaporate and it would never get that far - unless someone does want a civil war. When the Republicans withdrew support of Nixon. He did the only thing he could. If Democrats start to abandon Obama he can not survive - politically. Benghazi or the IRS may get this administration first. Most would prefer that. Since the identify fraud issue is so old (its well beyond a birth certificate) it would be problematic for the entire Washington power structure. Other scandals will like do in this administration — to keep this one in the bag for a few more years. There’s also the Richard Nixon/Watergate method. Produce enough damaging evidence via congressional hearings and/or grand jury proceedings that he is forced to resign. To date there has not been a Congresssional hearing held on Obama’s eligibility and no one has turned evidence over to a prosecutor for the convening of a grand jury to look toward issuing criminal indictments. The biggest problem with Eligibility is the attacks from so called “conservatives”.... like Ann Coulter, Michelle Malkin, Glenn Beck, and many others. If the Alabama Supreme Court rules against Obama....will those “conservatives” continue to support Obama? And what better way to prove Sheriff Joe right than to go to a grand jury with your evidence and indict, try, and convict somebody? When's he going to do that?